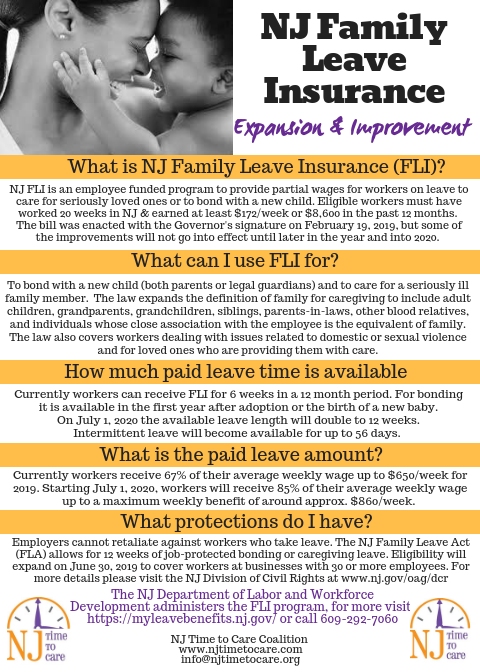 New Jersey Family Leave Insurance Expansion signed into law! The above flyer in Spanish is available here. Information about the expansion from the NJ Department of Labor and Workforce Development has been posted online. What is New Jersey Family Leave and Temporary Disability Insurance? The FLI program provides workers with six weeks of partial paid leave over a 12-month period and TDI is available for up to 26 weeks in a 12-month period. The wage replacement of both programs is currently 2/3 of workers’ average weekly wage, up to a maximum weekly benefit of $650 for 2019 (adjusted annually). New Jersey workers contribute a small fraction of their earnings to the FLI program (maximum contribution for 2019 is $27.52) and the TDI program (maximum contribution for 2019 is $58.48). Employers contribute a variable amount to just to the TDI program. Raises the maximum benefit for both FLI and TDI to approximately $860 starting July 1, 2020. This is an increase from 53% of the statewide average weekly wage to 70%. You may have the explicit right to return to work when taking leave under the Federal Family and Medical Leave Act (FMLA) and the NJ Family Leave Act (FLA). The FLA currently covers workers at businesses with 50 or more employees, this changes to include business with 30 or more employees on June 30, 2019.